Nicolas Bougaïeff rolls out a seamless hour of heady techno for our Fresh Kicks mix series. The Berlin-based artist knows more about minimal techno than most people — and he can prove it! Originally from Quebec, Canada, Bougaïeff has a doctorate in the subject, obtained from the university of Huddersfield. He’s skilled in the production department too, with his 2017 ‘Cognitive Resonance’ single re-launching the legendary NovaMute label, and a collaboration with another techno brainbox, Max Cooper, landing on Traum Schallplatten. 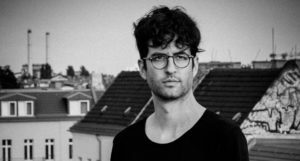 Bougaïeff’s music has been supported by the likes of Regis, Chris Liebing and Mary Anne Hobbs on BBC Radio 6 Music, and his debut album ‘Principles of Newspeak’, which dropped via his own Denkfabrik label back in November, stamped his name firmly on the map. Drawing inspiration from the appendix to George Orwell’s 1984, its theme is the distortion of truth, especially pertinent in our era of ‘fake news’ and social media skulduggery. In addition to metallic minimal techno sounds, the record also encompasses influences from soundtrack specialist Clint Mansell and experimental electronic musician Ben Frost. Bougaïeff’s Fresh Kicks mix is hard-hitting but hypnotic affair full of gruff industrial synths and driving percussion; check it out in full at the bottom of the page.